When you cook ribs in the oven, you end up with the most decadent fall off the bone ribs you’ll ever have. These ribs are better than any restaurant! Ribs in the Oven are a way to have ribs whenever you want! This simple rib cooking method will get you perfect, tender, juicy, fall off the bone ribs every single time. You can devour them straight from the oven or baste them with your favorite barbecue sauce and finish on the grill. 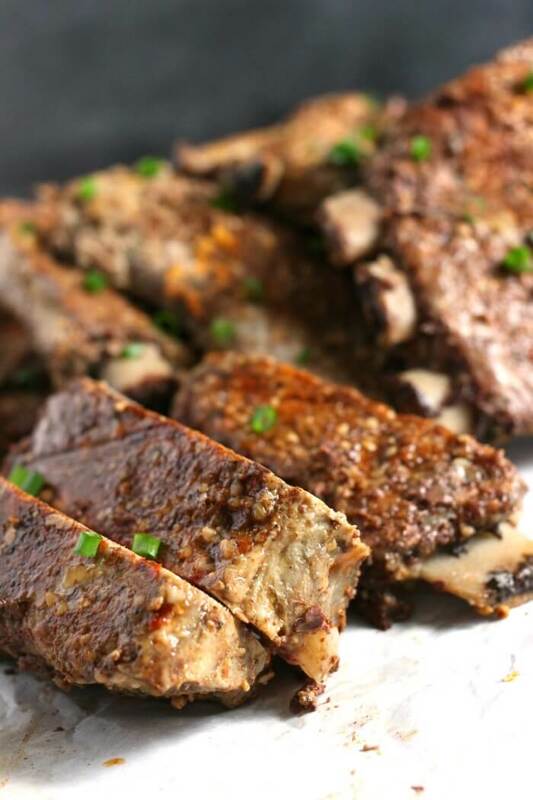 We like to serve our oven baked ribs with zucchini noodles and black eyed peas. And then cookies for dessert (I’m partial to these Raisin Bran Cookies!). 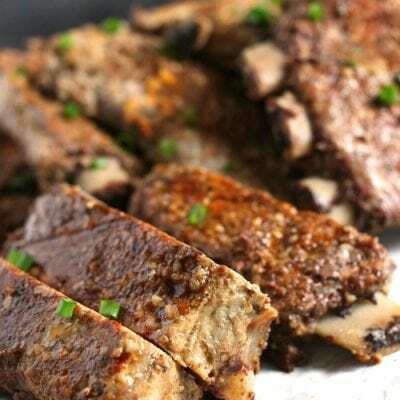 Pork Ribs – you can do spareribs or baby back ribs. Spice Rub – You can make your own or pick your favorite. We love McCormick’s Sweet and Smoky and Brown Sugar Bourbon rub. Barbecue Sauce – This is totally optional, but is a nice addition if you’re going to throw these on the grill. How Do You Make Ribs In The Oven? First, smother your pork ribs on both sides with the rub. Next, place meat side down on a foil lined baking pan. Make sure you choose one with a lip, because there will be juices released in the cooking process. Then, seal pan(s) tightly with foil and bake. You want to cover your ribs tightly in foil so the steam helps cook them as well. 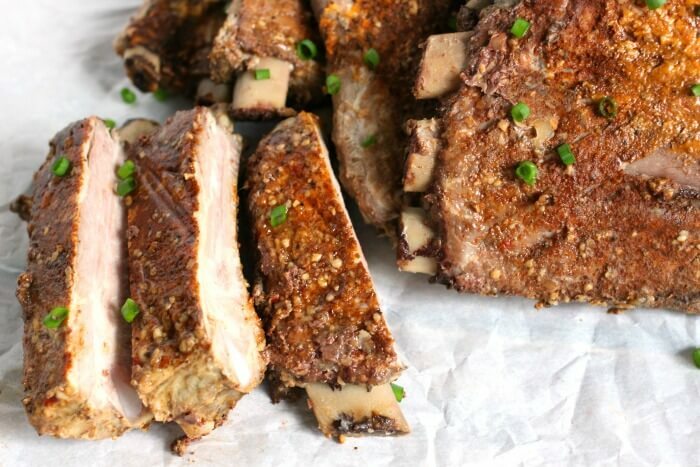 This keeps the meat moist and tender and makes sure you don’t get dry ribs. Next, remove foil and allow meat to rest. If you’re making ahead of time, now you can (when they’re cool enough!) throw them in the fridge. Finally, just before you’re ready to grill, slather the ribs with barbecue sauce. Then throw on a medium heat grill (or 350 degree oven) for 5 – 15 minutes, until heated to your liking! Yes, you can make Ribs in the Oven in advance! I love slow cooking ribs in the oven when we’re expecting company because you can make them ahead and then heat them up on the grill when everyone’s arrived. 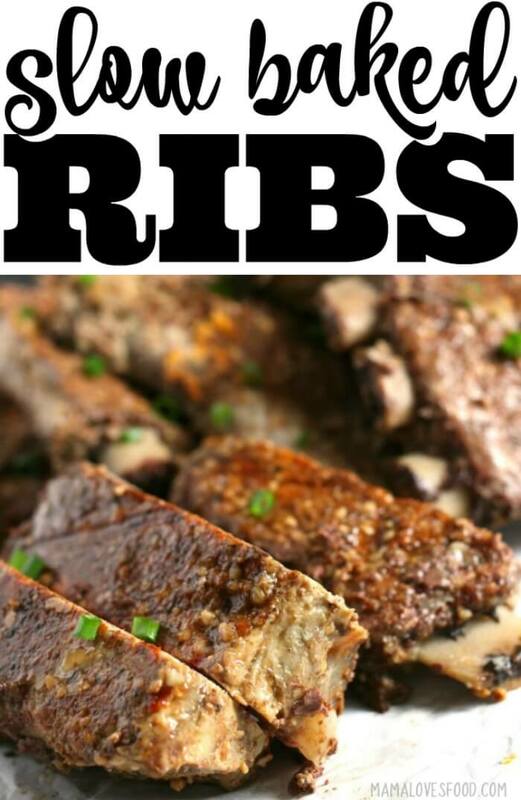 You can even make them days or weeks ahead and pop the ribs in the freezer! They’re a great option for gifting dinner to friends going through a hard time or for new parents. Skip the casserole, do something different! How long it takes for your ribs to cook in the oven can depend on various factors, like the size of the ribs. You should look for the rib meat to fall off the bone to know it’s done. However, here are some general guidelines! Cook your Ribs in the Oven bone side up (meat side down). This will give you the best result for tender and juicy rib meat. 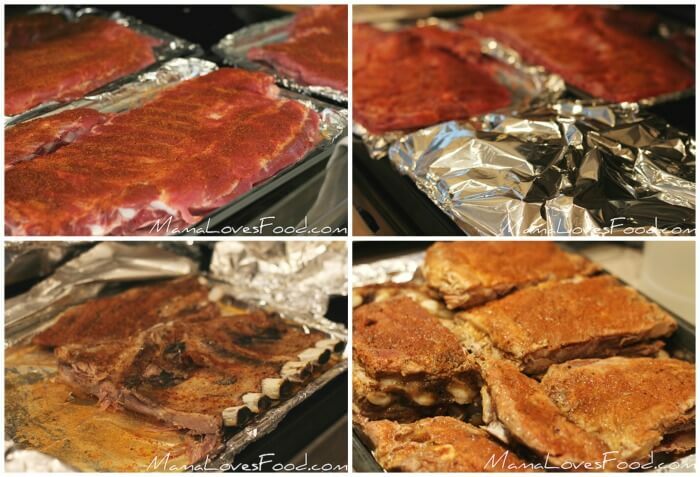 Meat from Ribs in the Oven can be used in so many ways. Just as is, or in pork tacos, on pizza, or in casseroles. You could even stir the rib meat into your favorite soup. Or hey! Make yourself a knock off McRib sandwich! Yum. I like to prepare extra so we can pull them out of the freezer on busy nights and enjoy a delicious home made meal. 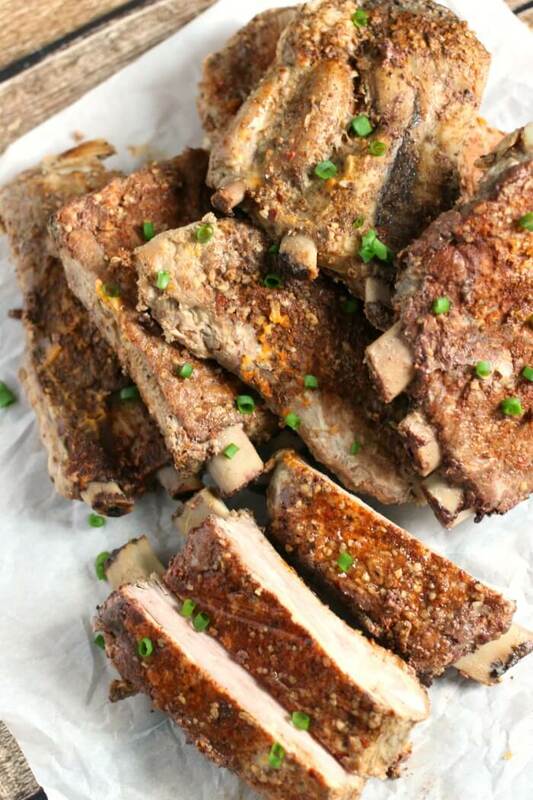 Pork ribs can be part of a healthy diet. Although they are high in fat, they are also high in the minerals iron and zinc. 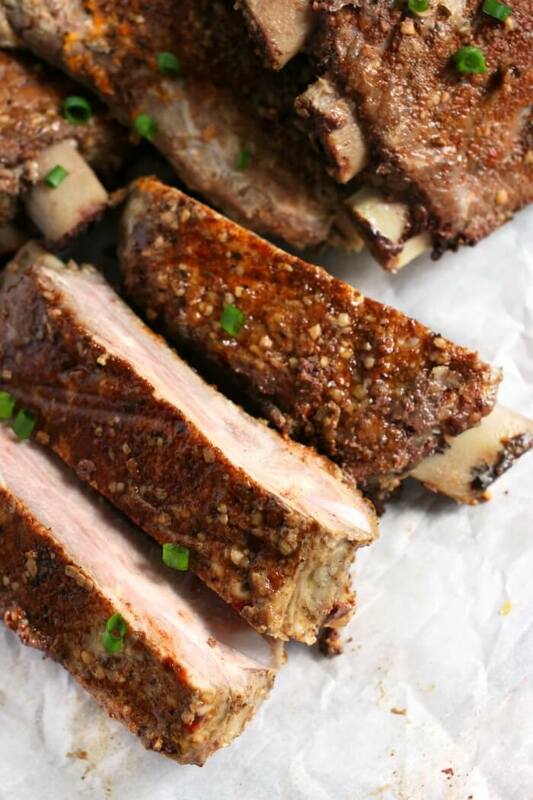 Pork Ribs are not lean, although they contain slightly less fat that beef ribs. However, pork ribs do contain more fat than lean cuts of beef, pork, poultry, or fish. If you’re serving these slow roasted ribs at a barbecue or with friends, I saw go old school with pure comfort foods as the side dishes. Here are a few of my favorites! We are major pork lovers at Mama Loves Food and here are a few more great recipe ideas like this one! 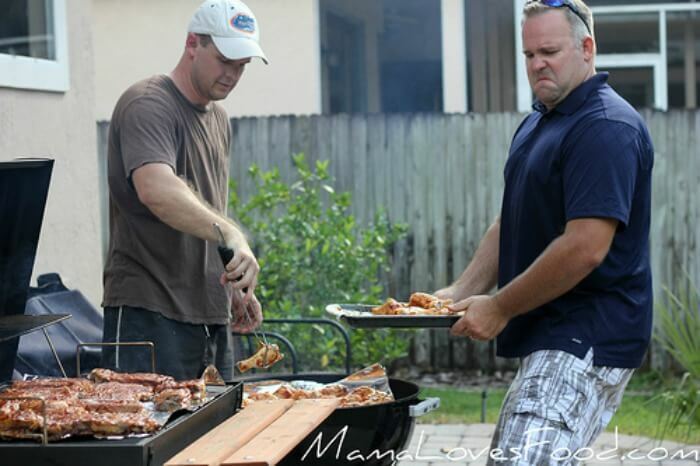 6 Burner gas grill – For Christmas last year we upgraded and gifted ourselves a 6 burner gas grill. It seemed like overkill at first, I mean it’s really really big. But oh my goodness, it’s been the most amazing thing! I love piling up the grill on Sunday afternoon with three or four different proteins and cooking a week’s worth of meat all in one swoop. It’s so convenient and there’s nothing like cooking outside and enjoying a cold beer. Don’t forget to SUBSCRIBE to the MAMA LOVES FOOD NEWSLETTER for FREE recipe notifications delivered to your email! Or SAY HELLO TO US on messenger and get notifications right to your phone! If you make one of our recipes, please use the hashtag #mamalovesfood on INSTAGRAM for the chance to be featured in our stories!!! FOLLOW MAMA LOVES FOOD ON ★ FACEBOOK ★ INSTAGRAM ★ PINTEREST ★ TWITTER ★ YOUTUBE ★ so you never miss an update – and JOIN OUR AWESOME FACEBOOK COMMUNITY! Making ribs in the oven is the best. 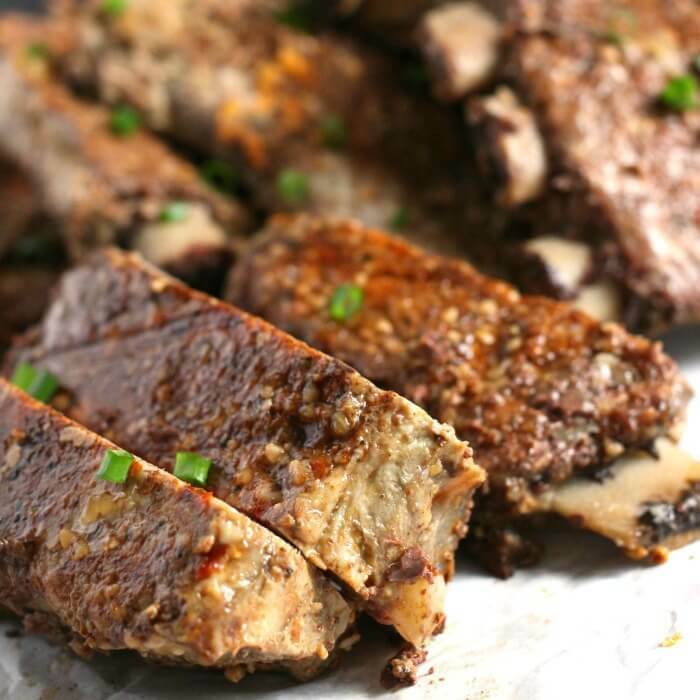 This simple rib recipe uses low and slow cooking in the oven to make the most decadent fall off the bone ribs you'll ever have. These ribs are better than any restaurant! 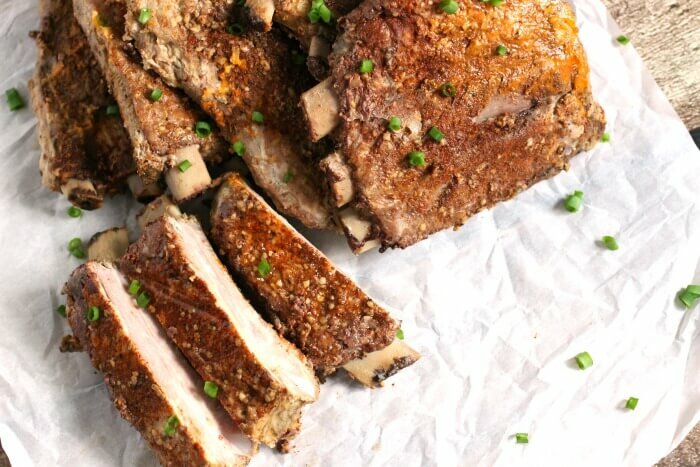 Smother your pork ribs on both sides with the rub. Place meat side down on a foil lined baking pan. Make sure you choose one with a lip, because there will be juices released in the cooking process. Seal pan(s) tightly with foil and bake at 225 degrees for 3 1/2 - 4 hours. Remove foil and allow meat to rest. If you're making ahead of time, now you can (when they're cool enough!) throw them in the fridge. Just before you're ready to grill, slather the ribs with barbecue sauce. Then throw on a medium heat grill (or 350 degree oven) for 5 - 15 minutes, until heated to your liking. « Cheese Board – Make the Perfect Cheese Board! 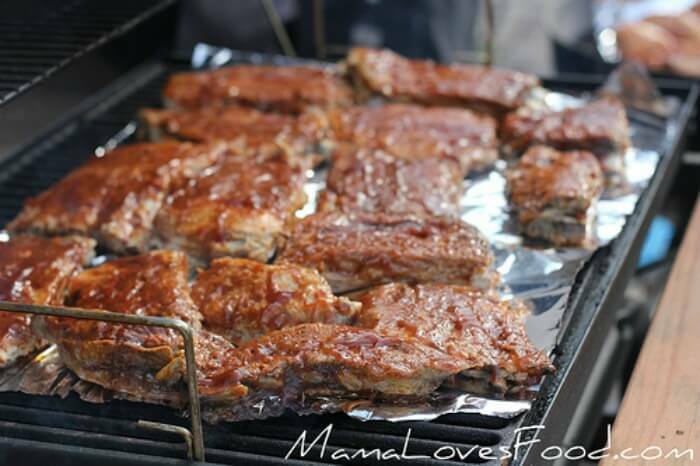 These fabulous slow-cook ribs in the oven were fantastic! The delicious meat literally fell off the bone. I love discovering yummy new recipes, and for my family this one’s a favorite. OH WOW!!! These Slow Cook Ribs were amazing! I’m a huge rib lover! !